You have until Noon, GMT, Friday 7th April to enter. Tina - I have created a small garden. There are lots of flowers, but also trees, a pair of birds, many butterflies and bees. The form for the garden consists, incidentally, of an empty tobacco can, which I have cut in length. For my work I have used a lot from the "Winnie Fruit Punch" - Big Bundle. 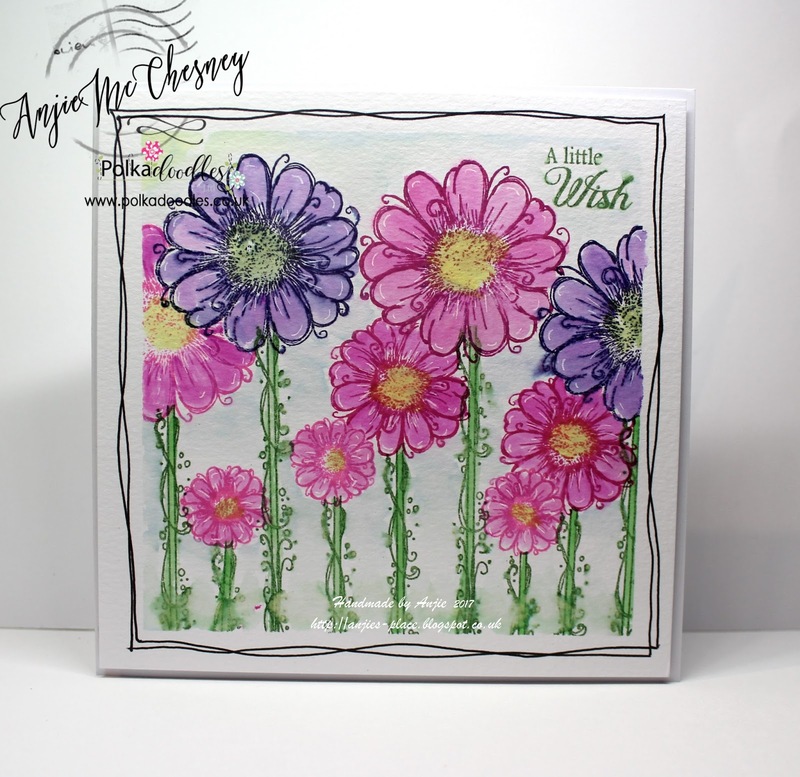 Winnie Dandelion Day and the Bee House is colored with Touch Twin Markers. Here you will also find individual components: "Dandelion Days - Winnie" and "Dandelions" Design Sheet"
On my Blog you can find much more details and photos. Bev here with some floral inspiration for you. I used the oh so cute Helga Flower Girl. 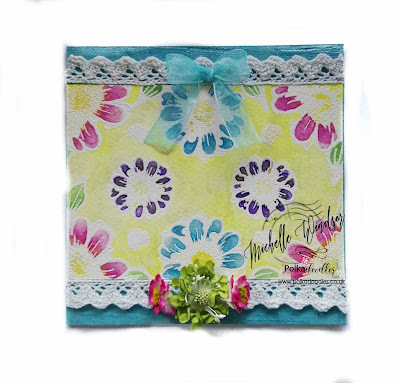 The added flowers & sentiment are available on the Big Kahuna Bundle. I coloured everything up using my Prisma Pencils. Then matted it onto matching card stock & added 2 decorative Corners. 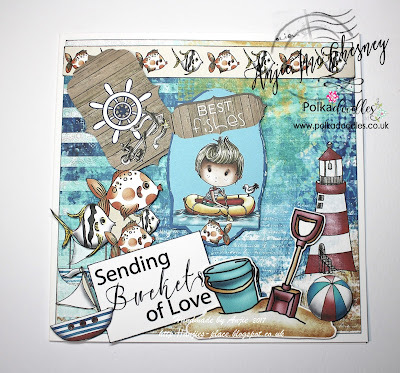 Scatty - For my card this week I have used one of the lovely stamps from Winnie Sugar Blossom , how utterly lovely is she, You can pre-order the Winnie stamps and paper pad collectors edition right here. 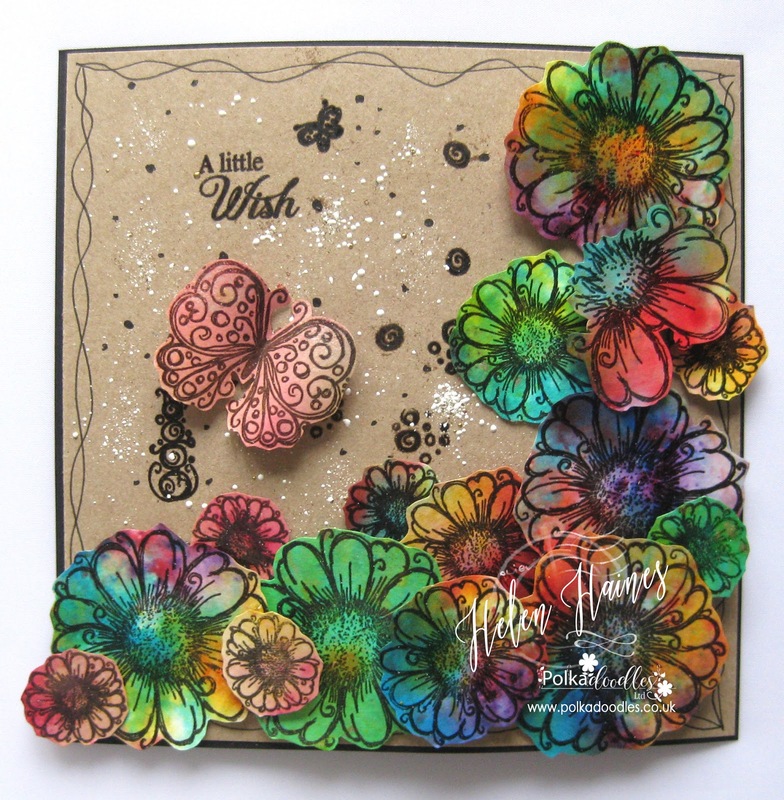 I have coloured up using pencils, and the flowers and paper are from The Summertime collection. 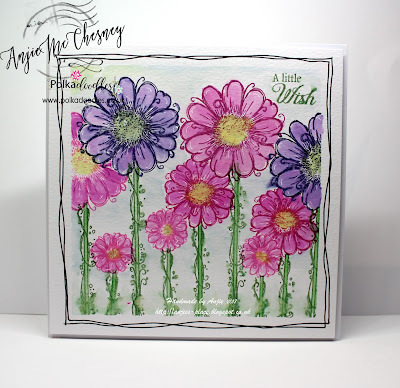 Michelle - I have used the Daisy Day Stamps Clear stamp set for my project I have stamped them with versa mark and then embossed with white embossing powder, then painted them with water colour paints and iridescent medium. Lou: I have used my Bella Fleur stamps to create my project but couldn't resist sneaking in one or two stamps from the Belle Papillion collection too. My mount is from the Ribbon Frame Gift Frame & Corners die set. Anjie - I used the fab stamps from the Daisy Days collection. You can get the stamps on their own HERE if you wish to. I did lots of masking and used different inks to stamp the images with onto watercolour paper. I then used my Kuretake Zig Art and Graphic pens to water colour the flowers and background. I added a couple of squiggly lines with a black fine liner pen and then mounted to picture on to 3D foam. More info on my blog. Closes Noon, GMT, Friday 7th April. The DT's twist on the challenge theme is to add some flowers. Ruth: I made this card for a work colleague who was moving teams - she actually does look like the image! I've used Work and Play Vol 11 for the image, papers and various elements plus the Bubbleicious Frame and flowers die. Helen - I decided to reach for some real stamping so what better than those beautiful Daisydays stamps just so pretty. You can find them right HERE in the store. I had a messy playtime using brushos stamped my flowers and a butterfly on the top and cut them out and arranged them on some kraft card. 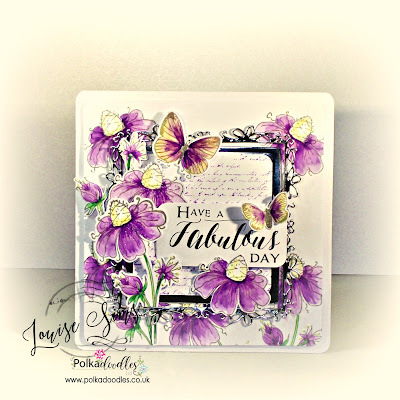 Lisa - I have used papers and elements from the Belle Papillon Big Kahuna Download, along with an Elegant Flourish die cut. 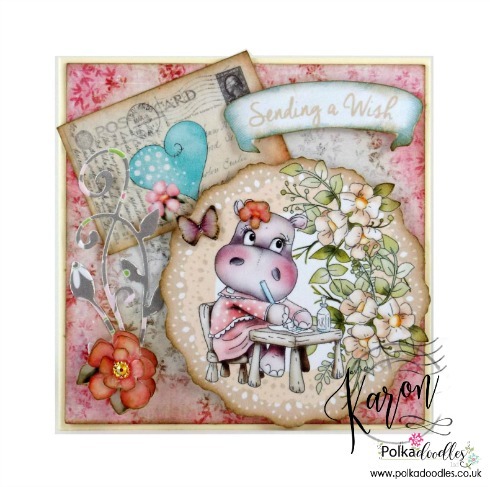 Karon - I am in the middle of making a little set of cards. This card measures just 4" by 4". I decided to add some glossy accents to the flower and the teeny butterfly. I used Helga Hippo Collection and Design Sheet 5 from the collection, which can also be bought as part of Design Sheet 3 Duo Download, if you prefer HERE :-) I also added a flourish behind the flower, using the wonderful Flower Flourish Die. Carol - I used the one of the very cute stamps from the Little Darlings range of Polkadoodles stamps, namely the Collectors edition boxed set: Winnie Sugar Blossoms Stamp and Paper kit, available for pre-order here. I stamped my image and then coloured her with Copics. I also used a background paper from the Winnie Fruit Punch Paper Heaven 2 collection. Pauline - I have created a shabby chic style card using the beautiful Polkadoodles Belle Papillon Vintage CD Rom. I used a topper from the Amazingness Collection, two Papers from the Paper Collection and a sentiment from the Sentiments & Alphas Collection. I printed the topper several times so that I could add some decoupage layers. creativEle - For this challenge I created a simple card using PRIMROSE digi, colored with my favorite pencils. You have until Noon, GMT, Friday 24 March to enter. Ruth: I've gone with Work and Play Vol 12 and used various different elements from the design sheet plus a wooden stick and some die cut silver stars. The Design sheets are great - print out, cut out the elements and then move them around for different combinations until you're happy with the layout! 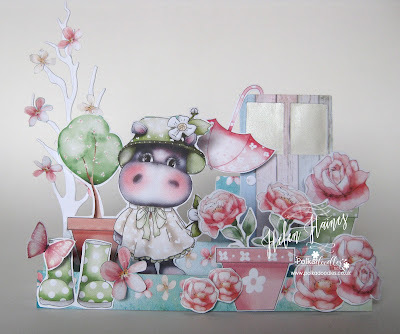 Helen - So excited this is the first time I've used Helga the Hippo, she's just adorable. 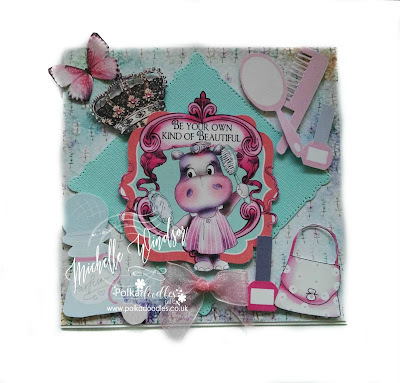 I've used parts of two of the design sheets in the Helga Hippo collection that you can buy in pairs. Here's the ones I used http://www.polkadoodles.co.uk/helga-hippo-design-sheet-13-duo-download/. They're just so versatile and Helga is a must for any project. 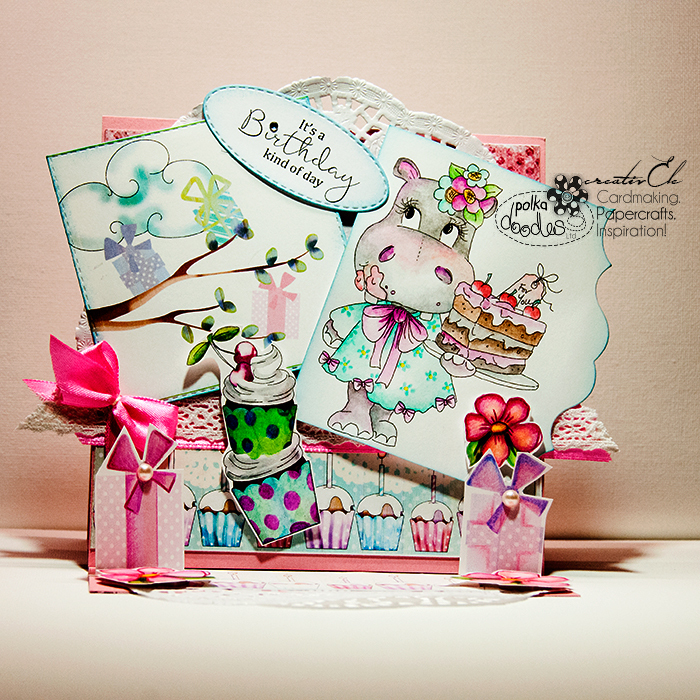 I made a stepper card from the design sheets and added a couple of those fabulous dies from Nikky. The cherry blossom branch to make the tree and the door to make a shed, which I used a paper from the Starfish and Sandcastles collection as its such groovy wood. Pauline - I have created a card using a design sheet from the adorable Twiggy & Toots Collection. 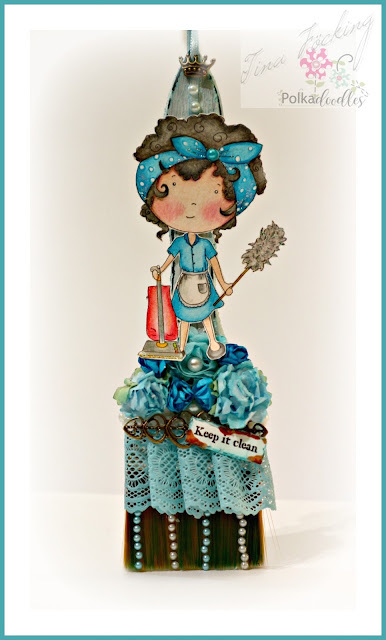 I used the decoupage image - I love my fussy cutting. The sentiment, papers and flowers all come from the collection. I also used the largest of the Elegant Nest Dies and the Flower Flourish Die. Lisa - I've made a card using one of the Helga design sheets that you can download from a set of two here. 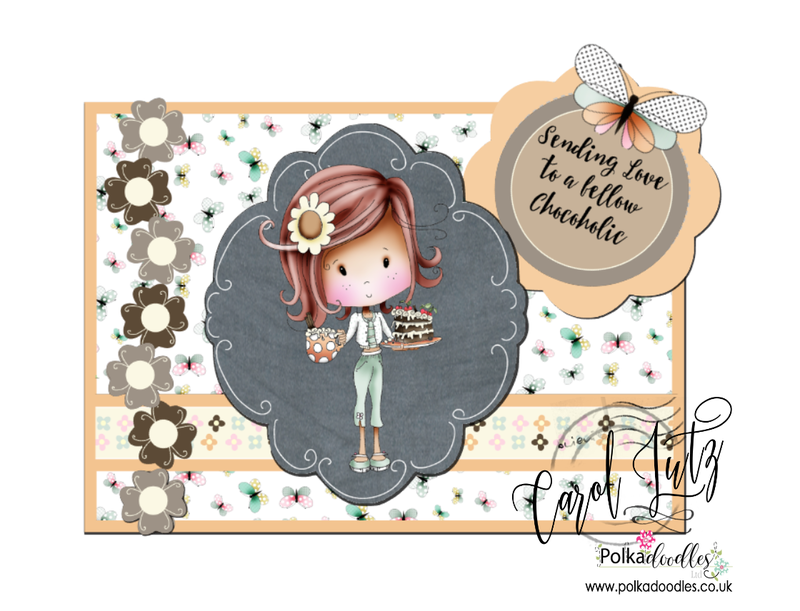 Carol - Today I have used Design Sheet 4 from Winne Sugar Sprinkles collection. CreativEle - I used one of 28 design sheet of HELGA collection for create this EASEL CARD. Closes Noon, GMT, Friday 24 March. Tina: I've used the design sheet "Work & Play No.12 / Scientist / Geek Girl" and built a small lab. Anjie - For this card I have used design sheet 10 from the Winnie Starfish and Sandcastles collection. You can get the whole collection on download HERE. Or on CD HERE. And of course you can just buy individual bits if you wish HERE. Claire C I've used one of the beautiful Design Sheets from the Belle Papillon collection and cut out lots of the gorgeous vintage tags to decorate my card. I couldn't resist adding some of Nikky's beautiful die cuts too, they are from Birdcage and Bird Doublet Die, Butterfly 1 Doublet Die along with Belle Papillon A5 Clear Stamps. Scatty Jan - For my project this week I decorated a little box using one of the lovely Helga design sheets you can find the collection in the store here. 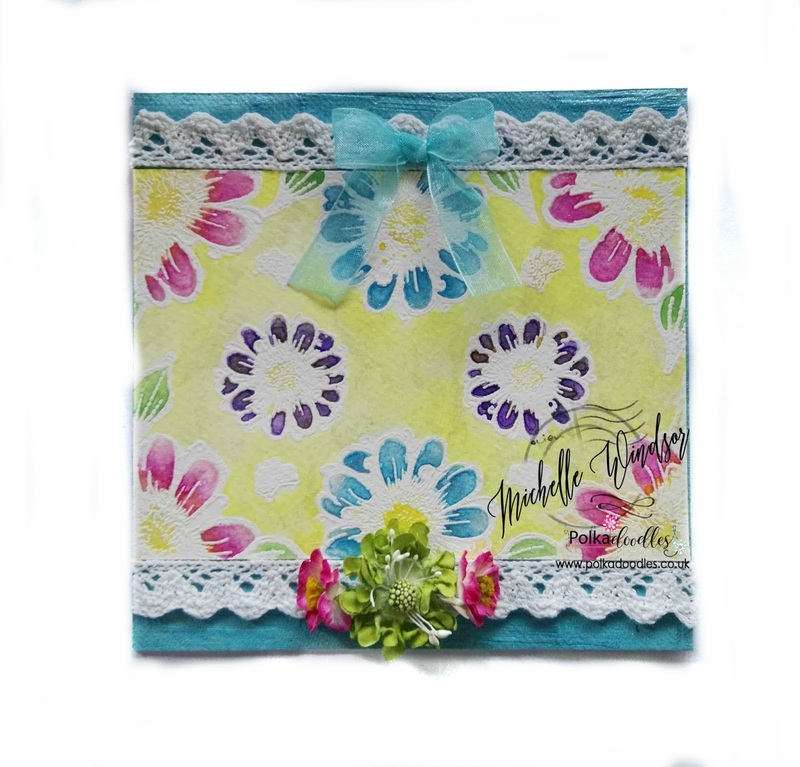 Michelle For my project I have used a Design sheet from the Helga Big Kahuna bundles I have used Design Sheet 4 which you can also buy on its own happy crafting everyone. Bev here and I've used Design Sheet 11 from Winnie Starfish/Sandcastles, There is just so much lushness crammed on a sheet. I couldn't decide what to put on & what to leave off!! All I added from my own crafty stash was 2 gemstones and a piece of raffia! You have until Noon, GMT, Friday 10 March to enter. Tina - First I painted the stalk of a big brush first white and then I decorated with many ribbons and lace. Then I glued a few flowers and small beads on it. After then I colored the small "Cleaning Lady" with Polycolor by Lyra and placed on the brush in the scene. A little glitter and a few metal charms round off the work. 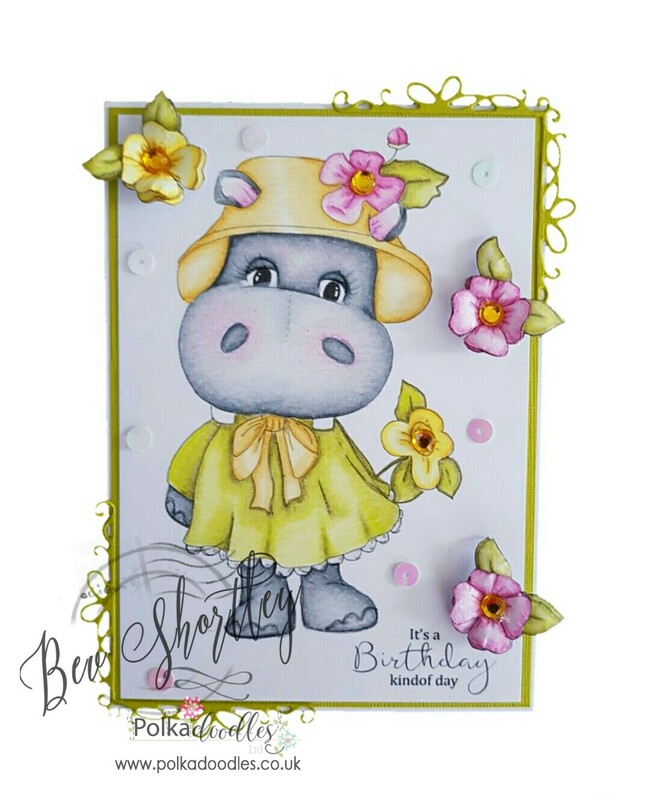 Bev here with my cute little 6 x 6 card using a combination of papers & flowers from Lemonade Fizz & the leaves from Bubbleicious Frame. I created a little patchwork background with faux stitching and then wrapped my ribbon around before adhering the shaped flowers & leaves. 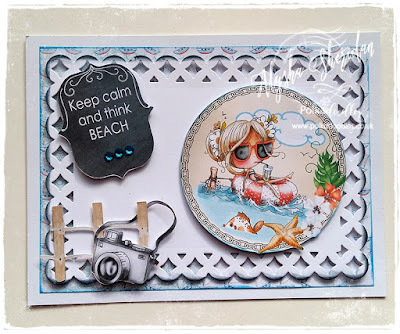 Anjie - I used a circle die to create and circular easel card. 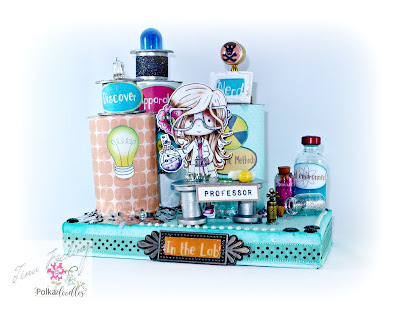 I used lots of elements from the Winnie in Wonderland collection on this card. This really is one of my all time favourite collections in case you hadn't noticed! 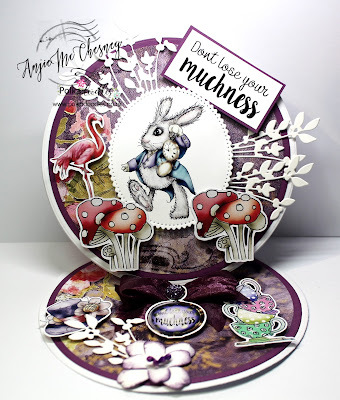 I used the small frame die from the Bubbleicious Frames die set to cut out Sydney the White Rabbit. I fussy cut all the embellies and mounted them onto the card using 3D foam. 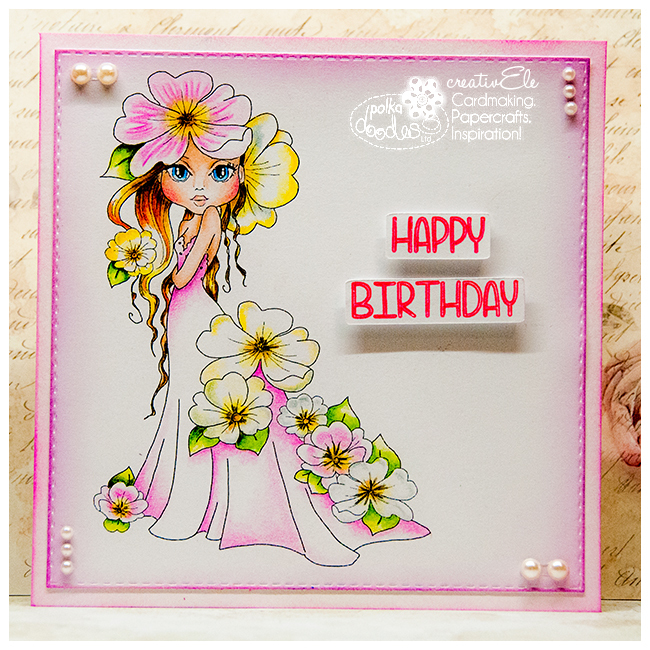 I added some extra interest with the sprig die and the flowers 2 dies. Finally I used some crushed silk ribbon and a jewelled gem to finish it all off. Scatty Jan - I decided on a box with a matching card for my project this week. 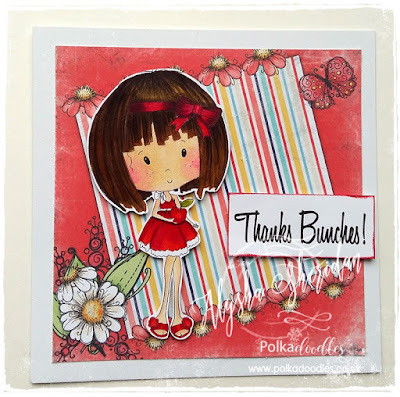 I used a mixture from the Belle Papillon, Bella Fleur, Dies, Stamps and Papers all can be found here. I doubled up some of the butterflys and flowers for depth. Added a little lace to the box to finish. Claire C - I've made a card using some of Nikky's beautiful stamps and dies. 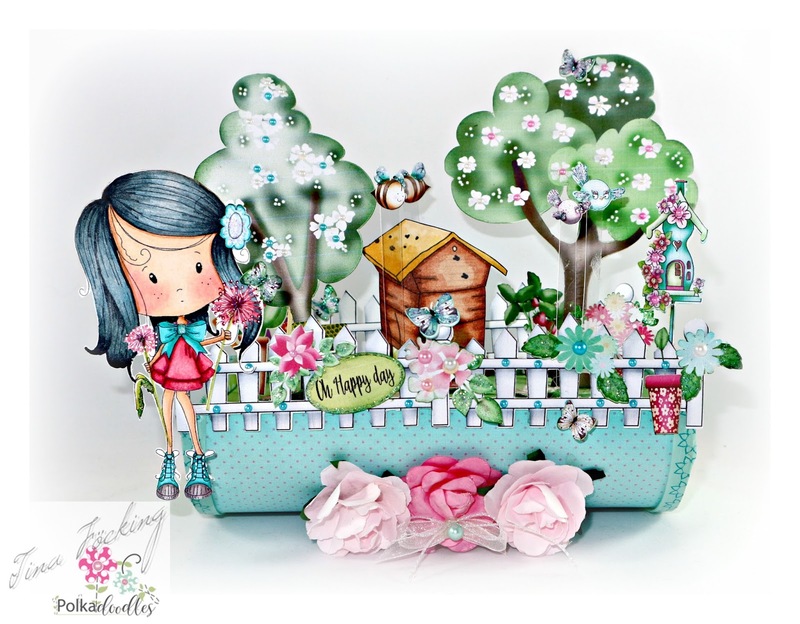 The papers are from the Belle Papillon Collection and the flowers are stamps from the beautiful Bella Fleur A5 Stamp set . I've die cut the flowers using the Flower Bunch Doublet Die and layered them up with 3d foam pads over the gorgeous Elegant Nest die cuts. 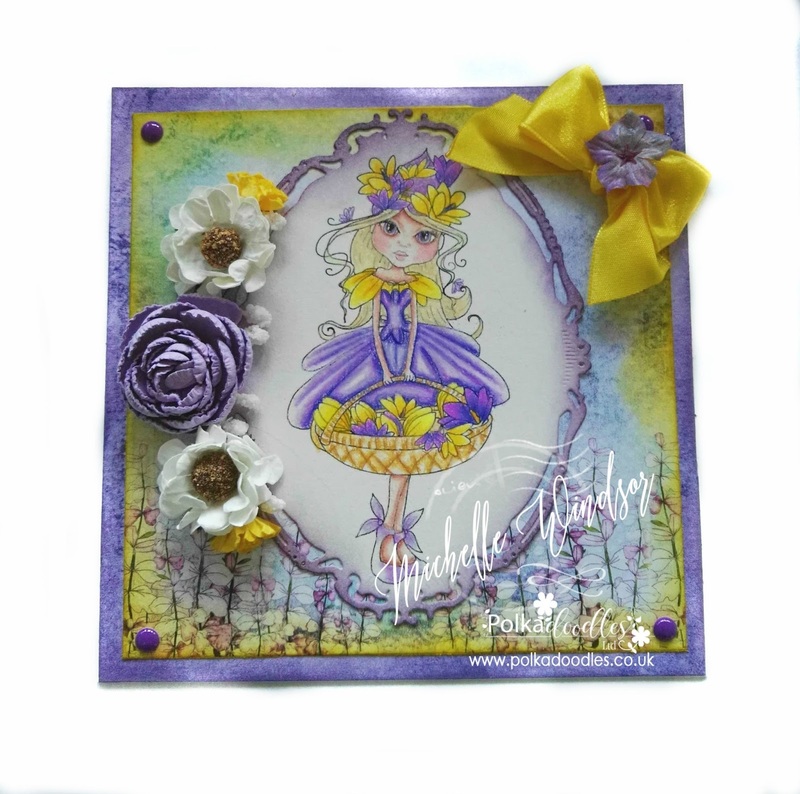 Michelle - For my project this week I decided to use the brand new The Darling Buds Crocus Image I just love these images can't get enough of them. Anyone that tries these image is going to wont more of them.